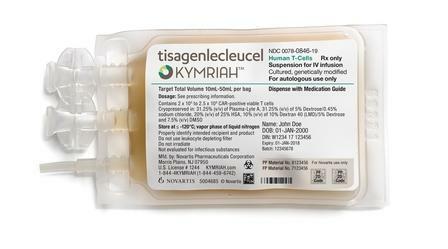 NICE has announced another momentous decision for lymphoma patients in England and Wales:, recommending Novartis’ chimeric antigen receptor T cell (CAR-T) therapy Kymriah (tisagenlecleucel) for the treatment of adults with relapsed or refractory diffuse large B-cell forms of the condition (DLBCL) who have not responded or have relapsed after two courses of chemotherapy. It is estimated that 200 patients will be eligible to access the treatment each year in England and Wales. Of the 11,690 new diagnoses of non-Hodgkin lymphoma in England in 2015, 4,688 were of the diffuse large B-cell variety. The notoriously costly therapy, with a price tag of £282,000, was originally knocked back by the UK regulator because it could not be considered cost-effective, but it later secured recommendation in patients younger than 25 with relapsed or refractory B-cell acute lymphoblastic leukaemia in November last year.